What is the status of the Australian house property market? Whether you’re looking to buy or sell, the question on everyone’s lips when it comes to property is, “What will the Australian housing market look like in 2018?” While there’s no way to gaze into the future and see exactly what will eventuate in the world of property this year, most experts in-the-know agree that house prices in bigger cities like Sydney and Melbourne could start to dip, while some other cities are in for a housing boom. Here’s a state-by-state breakdown of property market predictions for the year ahead. Sydney is Australia’s largest housing market and is at the most mature stage of the housing cycle, meaning demand and growth are at a peak. However, with the APRA cracking down on lending to investors and slowing foreign demand, Sydney’s housing market growth is slowing considerably, and it looks like this trend will continue into 2018. Given that the overall property market in Sydney is still relatively healthy, it’s likely that price growth will cool but not stagnate. Melbourne’s house price growth has outperformed Sydney over the last year and is tipped to continue this momentum into 2018. Although sales volumes have declined and houses have seen increased average time on market, it’s predicted that Melbourne’s strong population growth will continue to boost the housing market over the next year. Brisbane is still in the early stages of its growth phase thanks to relatively weak economic and population growth holding it back over past years. Looking forward, the city’s recently improved economy and affordable housing (compared with bigger markets) are likely to drive more pronounced growth this year, especially in middle ring suburbs. Property prices in inner-city suburbs are tipped to grow at a faster rate once ongoing construction of apartment housing in these areas is finished. 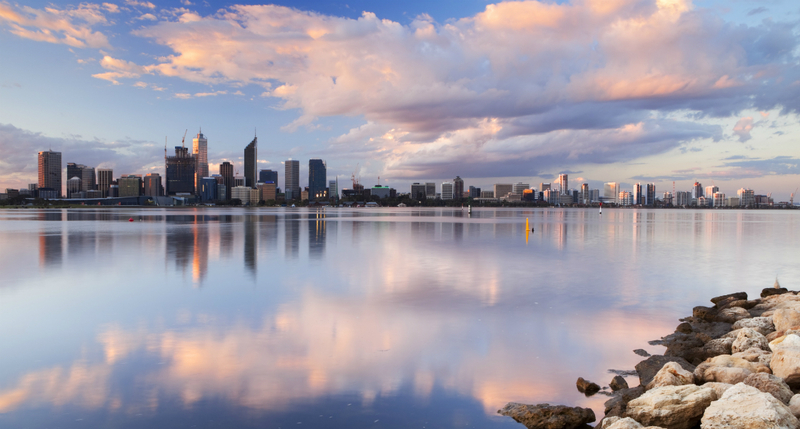 Despite increased demand in the Perth housing market, the average time on market for Perth properties remains high, as does seller discounting. The city’s lower price point and higher rental yields are attracting some interest from east-coast investors, which could see an uptick in property values over 2018 in line with demand from interstate. Likewise, development of new apartments around the city stands to open up increased investment opportunities for those looking to buy. View of Perth City from Swan River. Low price point and high rental yields in addition to new apartment developments around the city opens up strong investment opportunities. With the South Australian economy performing well, demand for real estate in Adelaide is likely to remain stable in 2018 across both the house and apartment sectors. Similarly, as investors skirt more expensive metro areas like Sydney and Melbourne in favour of affordable options, Adelaide is tipped to hold steady or see a moderate amount of growth throughout the coming year. With the Canberra housing market reaching the maturity phase of the growth cycle, house and apartment prices look to remain strong throughout 2018. Despite the potential for a decline investor demand as a result of the APRA’s tightening on lending, owner-occupier demand is likely to grow and expand into Canberra’s more affordable outskirts. Hobart house price growth is slated to lead the country in 2018 thanks to the city’s fast-growing economy and housing supply shortage. Housing values were up by about 11% in 2017, which came after a long period of flat housing market conditions, and it looks as though this upward trend will continue into 2018 as Hobart reaches its peak growth. If you’re thinking about buying or selling this year, talk to one of our property agents to get personalised guidance on how to get the most out of the property market in your area. We also offer a free property report that gives you a value estimate of your home. This report only takes 30 seconds to request, and provides in-depth sales data for your suburb and comparable properties to help give you an idea of your home’s worth.